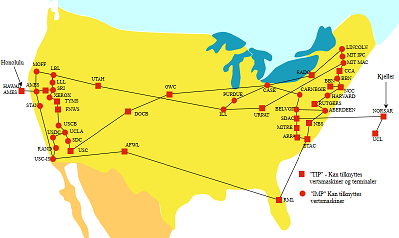 History of the ARPANET and Internet. It started out with a line speed of 2.4 Kbit/s and was later upgraded to 50 kbit/s. In comparision, this essay was written using a Cogeco Internet service in Canada that has plans as fast as 1 Gbps (billions of bits per second) download speed! The world's very first web site went online during 1990-DEC-20. It was created by Tim Berners-Lee OM KBE FRS FREng FRSA FBC, (1955-), a British engineer and physicist. The world's first WWW server as a NeXT computer at CERN, the European Organization for Nuclear Research in Switzerland. By mid-1994, there were 2,738 web sites online. By mid-1995, 23,500. unique hostnames registered. This reached 1 billion unique hostnames in mid-2014. However, about 75% of them have no active web sites attached to them; they are just registered domain names, for future use or sale to others. The Internet reached its 25'th anniversary on 2015-DEC-20. ReligiousTolerance.org was one of the earliest websites to go online in 1995-APR. It was probably about the first 15 thousand (0.0015% compared to today's WWW) to go online. along with Altavista -- a search engine now owned by Yahoo! -- and Amazon -- which needs no introduction. We have learned quite a few things by trial and error. The essays linked to this menu contain many hints about establishing and maintaining your own web site. Obtaining images, icons, graphics, etc. Google PageRank; promoting your site; earning revenue; checking coding; about the Internet..
"This lucid but impersonal memoir conveys some vital history and intriguing philosophy concerning the Internet, written by the man who invented such ubiquitous terms as URL, HTML and World Wide Web. British-born physicist Berners-Lee is now the director of the World Wide Web Consortium, which is based at MIT and sets software standards for the Web. In the late 1980s, he wrote the first programs that set up the Web, thus revolutionizing the Internet by allowing users to hyperlink among the world's computers. It was a quantum conceptual leap, and not everyone instantly understood it (some researchers had to be convinced that posting information was better than writing custom programs to transfer it). ..."